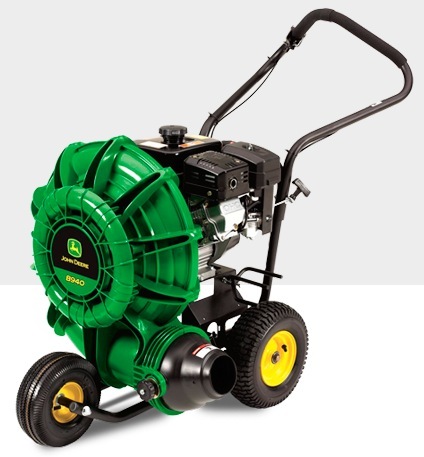 John Deere has built a solid reputation over the decades for providing top-notch equipment for the serious homeowner or professional. This proud tradition continues with the John Deere Leaf Blower. The John Deere model B940 is as impressive as the model number is short. This beauty is powered by a serious four stroke 13.50 ft-lb gross torque Subaru EX27 engine, which is known to start easily and work hard all day. The blower housing is made of reinforced composite material, reducing the weight while eliminating the possibility of rust. The outflow air can be directed using a fingertip control, and may be locked in 3 different positions. The four inch discharge nozzle delivers an impressive 200 MPH blast of air, which is enough to make even a large squirrel airborne. Both front and rear wheels are pneumatic, with a standard parking brake to keep this beauty from rolling down hill on it’s own. A 2 tear commercial and homeowner warranty seals the deal. The best thing about this futuristic looking machine could very well be that unmistakable John Deere green and yellow. There is simply nothing else like it! Plan on spending about $1100.00 for this beast. Black and Decker leaf blowers provide good function at a great price. For working around the home, they could be hard to beat.